1. Bring a large pan of salted water to the boil. Add the whole, unpeeled potatoes, bring back to the boil and cook for 8 minutes. Drain. When cool enough to handle, peel and cut into chunks. 2. Warm a large frying pan over a high heat. Add half the oil, and when hot add the potatoes and fry for 8-10 minutes, turning occasionally until just golden. Grate over some nutmeg, drizzle with the lemon juice and honey, and scatter over the chilli. Bring to a simmer for 30 seconds, then remove everything to a large plate or bowl, and keep warm. 3. Wash and dry the frying pan, and return it to the heat. Dip the halloumi in the beaten egg, then in the polenta to coat. Add the remaining oil to the frying pan over a high heat. Cook the coated cheese for 4-5 minutes, turning once, until golden. Cut into chunks. 4. 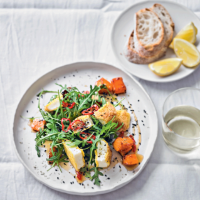 Place the warm potatoes, halloumi, rocket, sesame seeds and oregano onto a large platter or individual plates. Drizzle over the warm honey dressing from the potatoes before serving with crusty bread and lemon wedges to squeeze over.